Every time Georgetown Cupcake makes the news, the detractors shake their fists: The cupcakes aren't worth the wait, they're overrated, Baked & Wired/Hello Cupcake/(enter favorite bakery here) is better, bake your own stinkin' cupcakes. When we mentioned last week that a bouncer stands outside the shop now, more feedback came in. The Washington Post even received a response from the cupcake sisters themselves, who own and run the shop. They told the Post that even though everyone calls the position a bouncer, it's really more of a greeter -- someone to hand out menus, guides the line and directs traffic. 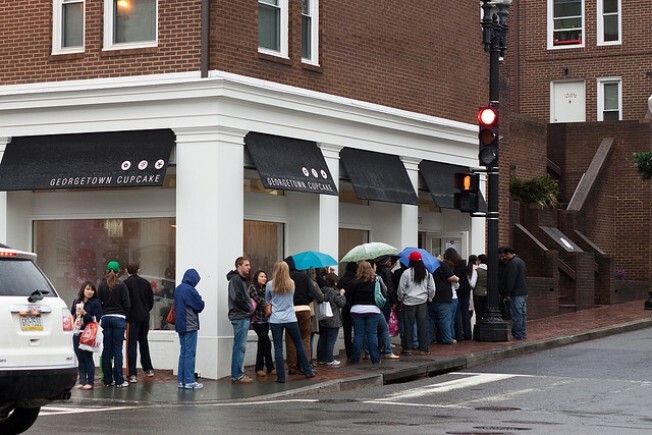 So instead of a 300-pound body builder to boot you out of line for bad behavior, think smiling college-age cupcake fan ready to expedite your Georgetown Cupcake experience -- as much as he or she can when there are 100 people in line.